► The consequences of a peat slide at the Braes, given their proximity to the SAC, could be severe. Realistically, there was little prospect of an official rethink on environmental grounds given that construction had already started – six months before the implementing decision of 16 December 2005. In the event, pernicious and ongoing leeching of construction-related pollution rather than peat-slide has been – and reportedly continues to be – the most serious ongoing issue at the Braes of Doune. 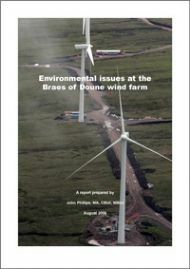 SWAP worked with local observers to collate pictorial evidence and prepare a report, Environmental Issues at the Braes of Doune, which provided early warning of the problems that were to plague the project. It was ignored by politicians and statutory agencies alike. The authorities continued to insist (and tell politicians) that there were no significant pollution issues associated with the project. In reality, even though they were unwilling to do much about it, staff from SNH, SEPA and Stirling Council were increasingly concerned by what was happening on the site. 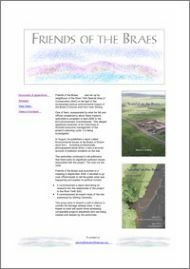 Local action group Friends of the Braes therefore commissioned a follow-up report, Scandal on the Braes, which describes research conducted by its members into the relationship of the wind-power project to the River Teith SAC and summarises a preliminary study of the site's waterways by Stirling University's Centre for River Restoration Science. It sought to breach the wall of silence surrounding the project with the express aims of containing the damage already done and of assisting those assessing comparable projects elsewhere who were also being treated with disdain by the authorities. 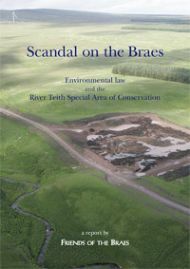 This report, which provided early warning of problems that plagued the Braes of Doune project, was ignored by the authorities. A follow-up study provided irrefutable evidence that the authorities were all but ineffective at monitoring the project.